"Great for brunch, luncheons, or whatever. Easy and quick to make. I find that this salad is always popular at get-togethers and usually disappears rather quickly..."
Fill a large pot with lightly salted water and bring to a rolling boil over high heat. Once the water is boiling, stir in the rotini, and return to a boil. Cook uncovered, stirring occasionally, until the pasta has cooked through, but is still firm to the bite, about 8 minutes. Drain and cool by running cold water over the pasta in a colander set in the sink. 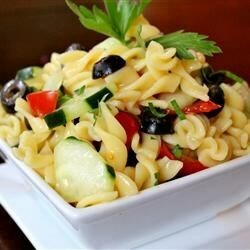 Combine cooked and cooled pasta with the cucumbers, onion, tomatoes, and olives in a large bowl. Pour the Italian dressing over the salad and stir to combine. Cover and refrigerate for at least two hours before serving. Watch how easy it is to make this pasta salad with fresh tomatoes and cucumbers. I had leftover fixins from tacos SO I made the tri-color rotini added the chopped onions,tomatoes & finely shredded colby/jack cheese & drizzled on red wine vinegerette dressing. I love this recipe and have made it for years! I add a little bit of red onion and feta cheese to make it a little more "Greek." Very good! I added a cup of parmesan cheese as well, it's quick, easy & very good!